"Standing tall, - I've learned to stand tall, to stand up when I fall"
The German Final was held on March 29th at the German Theatre in Munich, hosted by Sabine Sauer. Before the final, there were 2 semi-finals - click here for details: GERMAN SEMI-FINAL 1984 The winning song was chosen by the votes of approximately 500 people who were chosen by an institute to be representative of the German population. 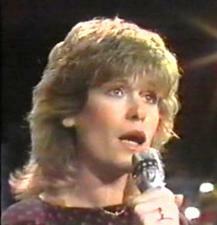 Mary Roos had already represented Germany in ESC 1972. She also came 2nd in the 1970 German Final & 3rd in 1975. At the ESC she came equal 13th.